It’s a Saturday morning, Scouts are running from one base to the next at a Scouting in Schools (SIS) camp at the Western Cape Gilray campsite. As I walk around the camp I see a familiar face running a base where the teens are learning how to use an axe safely. Siphosethu “Sethu” Goithiyeza (19). 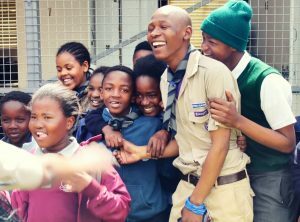 Sethu joined the 3rd Gugulethu Scout Group as a child and is now running a Scout Group as an intern with the Scouting in Schools (SIS) programme. 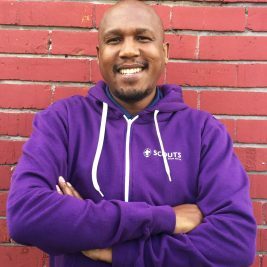 “My grandfather was in the military when he was younger and wanted me to join the Scouts to learn more discipline and skills. Every time I came home from Scouting he would ask “What did you learn?”, and I would have to show him some of the things I learnt. It was really nice to be able to show him”, says Sethu. 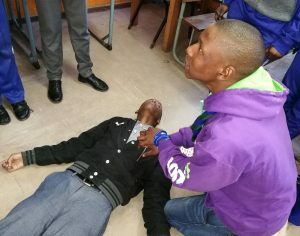 Sethu teaching first aid at a SiS meeting.